Somewhere between 2009 and now I discovered on Netflix I Am Love (Io Sono L’amore), a film starring Tilda Swinton. Her character Emma Recchi is a severely beautiful Russian, married into an aristocratic-industrialist Italian family. The opening scene is a snowy Milan, which matches well with her mansion’s hard lines, muted color palette, and imposing spaces. I recall my visceral reaction to this introduction, which was cold and serious but romantic, in a way. Accurate or not, what appealed to me was a simpler, more refined, even dignified environment. No television in sight, soft incandescent lighting, and plenty of space for the important elements: family dinners, a queen’s wardrobe, reading and swimming. 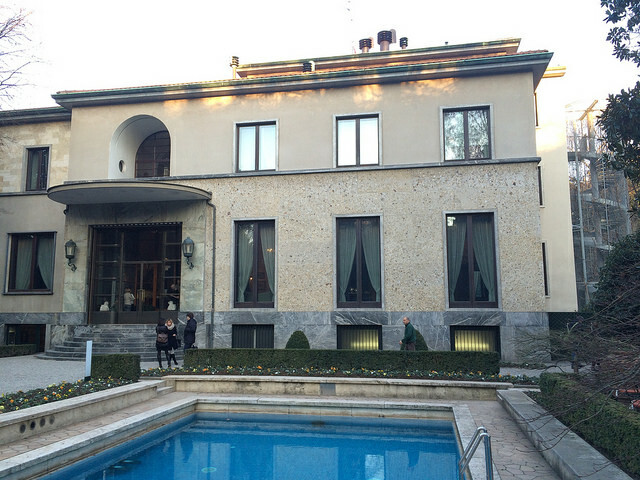 This is Villa Necchi (“VN”), in reality a historic home in Milan’s Northeast triangle, along Via Mozart, five minutes from the Palestro metro station. It was designed by Piero Portaluppi and completed in 1935, shortly before the heavy combat period of World War II. The original owners left it only two years after taking ownership, and would not return until nearly ten years later, after Allied occupation. It was after watching Mrs. Recchi in I Am Love, clad mostly in Jil Sander and Hermès, abandoning her privilege for forbidden love, that I knew Milan was in my future. The house’s volume is overwhelming, and the original wood floors were unobstructed by rugs. Similarly, towering windows were covered by sheers rather than thick drapes and ornate furniture eschewed in favor of streamlined designs. Seriousness is not lacking here. According to my guide, this was both a manifestation of Portaluppi’s personal style and that of the fascist party, which is rumored to have paid for some of the home’s construction. Excepting its insular, fortified emphasis, many of VN’s details are reminiscent of the homes designed by Frank Lloyd Wright, who completed Fallingwater in 1935. Both designers made liberal use of wood, stone and marble, and above all, clean simplicity and modern amenities. Mr. Wright was however more interested in bringing the outside in than providing measured access. The gardens and what lied beyond, in Italy at that time, connoted danger and hardship. Though Villa Necchi is decidedly colder than the prevailing style of the time, it did include several firsts: a heated rectangular pool off the front entry, translucent wall panels to provide the maximum natural lighting to interior rooms, Italy’s first residential elevator, and a glassed all-season sunroom outfitted with living foliage and 360° heating. These innovations were not traded for formality however, with fully separate staff spaces and sequestered cooking and cleaning facilities, all intended to minimize interaction between the owners, their guests, and their employees. My favorite elements of the Villa were the materials and details, which for all their stark modernism, were still luxurious and intricate. Each public-level room is unique, with details and decor not seen elsewhere within. The dining room is perhaps the most ornate, with a maritime motif ceiling in plaster relief and manila-hued parchment wall panels. Burl walnut wood an inch thick lines the stairwell, and Yugoslavian black marble adorns all of the bathrooms in the house. Only one is trimmed with white onyx, which shines fiery in the morning sun. The hallway upstairs, separating the owners’ bedrooms, is lined with both bureaus and entries which are indistinguishable from one another. Some doors contain pillbox hats and winter furs, while others open onto the bedrooms and bathrooms of Milan’s former elite. Maybe the filmography filter embellished much of this aesthetic back in 2009. After touring the set and drinking in its coy touches recently, I can say with certainty it added very little to what was there in 1935 and is preserved today. After the death of the original owner, the house was left to the Fondo Ambiente Italiano (FAI), with the request that it be maintained in as original a format as possible, in perpetuity. I don’t want to overstate this…but Villa Necchi is an architect’s dream world. Many meanings and stories underline the design choices. With all its seeming harshness and sterility, it is beautiful if you appreciate clean, sober design, and is a must-see, as part of Milan’s modern history. Regular tickets are €12 for adults (€5 for students), and guided tours are given in Italian, English, Spanish, and French on request, about every two hours on weekdays. I too loved that movie and feel in love with the house! I didn’t realize it was close to Milan. I want to go!